What is anxiety? Anxiety refers to worry, fear, or the sense that something bad may happen. Anxiety isn’t always negative. It can serve as a warning system, calling our attention to danger. Anxiety may help us avoid dangerous situations or exercise extra caution, thereby protecting us from negative consequences. However, anxiety can also be harmful when it causes us to avoid too many situations out of over-blown fear. Think of the difference between avoiding walking close to a cliff edge vs. avoiding going to a party. In the first situation, anxiety is protecting us from the danger of injury or death due to falling. In the second situation, anxiety is protecting us from feeling uncomfortable in a social situation; but in the process anxiety is also preventing us from social connection and the possibility of an enjoyable time. In the scenario with the party, anxiety is in over-drive and is functioning more as a negative influence than a protective one. Anxiety includes thoughts, bodily sensations, and actions. Anxious thoughts include worry or fear about what might happen, for example, “I’ll say something stupid at the party and make a fool of myself”. Anxiety can cause physical sensations such as rapid heartbeat, chest tightness, shortness of breath, or knots in the stomach. Actions stemming from anxiety tend to fall into one of three categories: fight, flight, or freeze. The fight response can cause us to lash out, flight causes us to avoid situations, and freeze can leave us stuck not knowing what to do. We can’t get rid of all anxious feelings, partly because some anxiety is helpful to us. However, we can develop ways of coping with anxiety to limit its negative impact on our lives. Treatment for anxiety can include two different types of approaches: relaxation and challenging our thoughts. Relaxation techniques can be used to calm down the nervous system and our racing mind. Challenging our thoughts can help us see alternatives to the event we’re worried might occur. 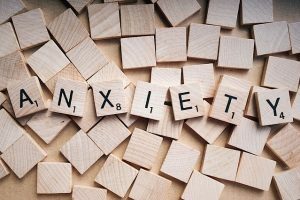 As a therapist, I help people learn ways of managing anxiety and their reactions to stress using these two types of techniques. Anxiety can be a useful tool if we learn how to manage it, and therapy can provide the strategies to do so.